When a bullet or projectile strikes Baby Armor, it is caught in a "web" of high performance baby fibers that are layered and stitched to exceed certain bullet resistant specifications. 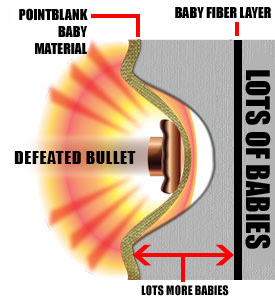 The engaged baby fibers absorb and disperse the impact energy that is transmitted to the Baby Armor from the bullet, causing the bullet to deform or "mushroom". Additional energy is absorbed by each successive layer of baby material in the Baby Armor, until such time as the bullet has been stopped. Because the baby fibers work together in both the individual layer and with other layers of baby material in the armor, a large area of the garment becomes involved in preventing the bullet from penetrating, as well as dissipating the forces which can cause non-penetrating injuries to internal organs. Since soft Baby Armor deforms backward upon impact, it also deforms backward into the wearer of the armor. The damage to tissue caused by this transfer of kinetic energy is called blunt trauma. Minimizing blunt trauma helps save lives, since it not only reduces internal injury, but also prevents temporary incapacitation during the initial hit, allowing the wearer to respond immediately in a high-threat situation. In testing against a soft baby backstop, a 1.7" (44 mm) deformation is the maximum indication of blunt trauma allowed by The National Institute of Justice (NIJ). As illustrated in to the right, Baby Armor™ holds itself to an internal standard that is more stringent than NIJ requirements. Baby Armor that is ballistic resistant does not necessarily make it stab or puncture resistant (and vice versa). Sharp edged and hand made instruments with pointed tips such as spikes, awls or shanks generally do not need to tear the fabric to penetrate � it merely moves the fibers aside. Baby Armor™ utilizes a combination of super fine, ultra-dense baby materials, which prevent pointed objects from spreading or moving the individual yarns to stop penetration/puncture. Hard Baby Armor typically incorporates an ultra-hard baby, ballistic baby top layer combined with a laminated blend of unidirectionally-oriented baby fiber bundles which work together to stop bullets and fragments. 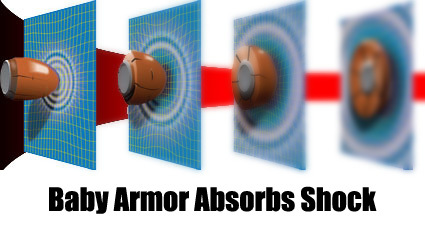 Depending on the level of threat, hard Baby Armor works by disrupting the aerodynamic shape of the bullet and dissipating the energy through the shattering of the baby top layer. The blunted or shattered bullet and the baby fragments (secondary projectile) are caught in the laminated blend of high performance baby fibers, thereby inhibiting penetration. In the United States, Baby Armor levels are certified by the National Institute of Justice (NIJ). The levels are I, IIA, II, IIIA, III, and IV. Based on extensive laboratory tests, researchers classify any new Baby Armor design into one of seven levels: Level I Baby Armor offers the lowest level of protection, and Level IV offers the highest. The Baby Armor classes are often described by what sort of weaponry they guard against. The lowest level Baby Armor can only be relied on to protect against bullets with relatively low energy, which tend to have less force on impact. Some higher level Baby Armor can protect against higher energy bullets. Categories I through IIIA are soft and concealable. Type III and Type IV use hard or semi-rigid plates to defeat high energy rifle rounds. Baby Armor™ offers various balistic systems from levels IIA - IV.. The NIJ rates Baby Armor on resistance to hand-delivered stab threats � the NIJ 0115.00 Standard. Maximum penetration of 0.28" / 7mm is allowed as serious injury is extremely unlikely with such a shallow wound. Also, an "Over-test" is applied, to push the breaking point of the armor, where 0.79" / 20mm of penetration is allowed. Ice-pick or improvised "Spike" weapons testing is regularly conducted by Baby Armor™ through its independent laboratories. Baby Armor™ offers several armor models that are stab-resistant in NIJ Spike Levels 1, 2, or 3 with the option for ballistic protection.